Hey guys, Chief Siddharth here. Chelsea is a complete team the way things stand. Mourinho’s summer signings after the FIFA world cup have seriously boosted their overall competitiveness, and their midfield is one envied by most. With a side packed with so many quality midfielders and great poachers in attack, this Chelsea side can be used in many ways. Chelsea is no doubt a favourite for many FIFA players. Particularly those who hate the usage of overpowered teams like Real Madrid and Bayern Munich. Even for those who love using the best teams, its obvious that the club has a power-packed side capable of competing with the best in Europe. All it takes is a little prep-work. Many readers will wonder how to fit Chelsea into their specific formation/style. The good news is that Chelsea have a team that can fit into multiple playing styles. They have pace, creativity and even gritty, physical attributes present in their players. Blessed with a variety of midfielders, Chelsea can be played in multiple ways. Before we jump into the tactical omelette, its well worth looking at what we shouldn’t do when playing with Chelsea. Never play a 5 defender formation. It is possible to play such a formation with attackers as wing-backs, but its not preferred. Too many cooks spoil the broth– Try not to have too many creative midfielders in the starting lineup. Try to use 2 out of the trio of Ramires, Fabregas and Matic in your side at all times. Cutting that figure to 1 could have your side a bit top-heavy. Don’t resort to one method of goals: Set pieces, free kicks, crosses, Counter-attacks, use many techniques to bag your goals. Going for one method is fine, but looking to exploit your oppositions weakness more often will lead to victories. That’s where the versatility of this Chelsea side clicks in. Time to look at potential styles and formations. Defenders: Ivanovic, Azpilicueta/ Luis, John Terry, Kurt Zouma or Gary Cahill (speed or strength). This is a formation which is deployed by Jose Mourinho, and generally tends to be his starting lineup. In most situations where your likely facing the unkown, this is a good lineup to play with. Quite self explanatory, with so much pace available upfront and such a strong back four. Just a few FAQs regarding this formation. Possession Play or Ruthless Counterattacking? Good question. It depends on player preference. Do you find Hazard’s speed or Fabregas’ creativity more alluring? Do you like keeping a high backline or would you prefer a safer approach? Do you like crafting difficult goals at high speeds or slowly break down an opposition’s defense? Your pick. Do I change my formation mid-game or make specific substitutions if i’m being hammered? Changing formation midgame is a good option to freshen things up, but is time consuming and could cost you all your substitutes. Just look to the subs for inspiration. Didier Drogba is available for an injection of strength, and Ramires is available if Cesc Fabregas is not shielding the back four enough. Juan Cuadrado can also spice things up with his speed for a tiring Willian. Kurt Zouma and Gary Cahill are interchangeable depending on the threat the opposition poses. The options are there. Goalkeeper and Defenders stay constant. Strikers: Costa and either Remy or Drogba. This formation requires more thinking, and has its own advantages. While chance creation was high, the 4-2-3-1 formation had room for a single striker, and Costa can only do so much on his own. This formation also has more options and variable positions. The question that you should answer first is whether you prefer risky attacking play or would like attackers who don’t venture too far forward. The decisions depend on it. In defensive midfield, your left to choose between Matic and Ramires. Technically gifted muscleman or tireless speedster? Both bring decent physicality to the table, and while Matic may seem to be the overwhelming favorite for the position, Ramires can make attackers seem twice their age in terms of speed. Personally, I would start Matic against most sides and bring Ramires on if need be later on, especially when the attackers have daunting speed. Both are defensively responsible though. The problem with this formation is that it forces us to choose between so many quality players. Its not real life though, and in this case its easy to decide who starts. Cesc Fabregas has been wonderful in his time at Chelsea, while Oscar is a hard-working attacking midfielder. To choose between the two is committing a crime. But the obvious choice in this game is Oscar. With all due respect to fellow Cesc, Oscar possesses speed and a defensive ethic which fabregas does not in such a role. Unless your playing the slowest of possession games, Oscar is a mainstay. The Strike Partnership: Diego Costa starts all the time. But Loic Remy or Didier Drogba? Drogba is the big man, who can physically assert himself for goals. Remy offers speed and another attacking presence that drifts around the defense. I would go with Drogba for sure, as he forms the perfect attacking partnership with Costa. But Remy can be used against slower defenses. I’m not including a tactic 3 because this side is extremely versatile. Here are some more FAQs. Is it possible to play 3-5-2 or 5-4-1 with Chelsea? Under strenous circumstances, yes. 5-4-1 is basically 4-4-2 but you drop the extra striker and use all three of your first choice center backs. Then play the counter attack. 3-5-2 is a possession formation, and you use Drogba in place of one of the full backs (or center backs, if your so confident). Do you counter or pressure with 4-4-2? Pressure. Your using a lot of fast players who are used to attacking in midfield. Asking them to defend for their lives could spell disaster. Do you go for central or wide attacking? I would say mix it up. But if your good at dribbling, have a go with Hazard at the full-backs often. It could prove wasteful but may lead to goals. Central play is challenging but more on that later. If I adjusted the custom tactics, how would I adjust the width and chance creation sliders? If your using 4-2-3-1, you can afford to increase chance creation for shooting and make it even a bit risky as your shielded with two defensive shuttlers. You can maximize your width though, and spread out play. 4-4-2 means you have to lower the risk of chance creation, but can choose to cramp up play. You can choose to play a narrow game, and increase your crossing chance creation. This is mainly if you have an aerial presence in Didier Drogba. Does Chelsea stand a chance against Real or Bayern in online seasons? They stand a very good chance, but judging your opponent’s skill level is necessary. You need to make smart substitutions, and decide whether your going to scrap-fight the game or press your game on your opponent. Attack their weak link, whether it’s a slow Dante or fleet-footed but weak atttackers. You need different more defensive wide players to use such a formation. Not my recommendation. 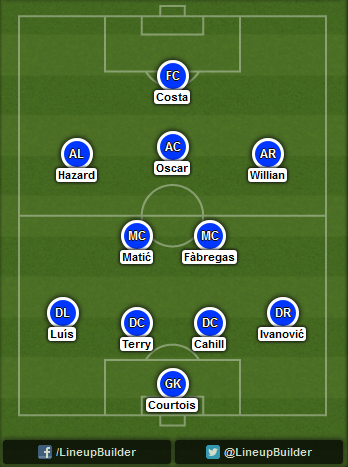 Matic, Ramires and Fabregas can be tried in a 4-3-3- holding though. Smart Passing or Individual brilliance? Its all personal preference, but i would say a mixture of both. Chelsea is not a perfect side but they allow for you to develop your all round game, whether it’s dribbling or passing. If your opponent is playing a formation where the attacking midfielder or striker is directly clashing with your defensive midfielder or center back, go for it. Especially when taking on players like Cristiano Ronaldo and Sergio Aguero in central positions, having Kurt Zouma glued to these players can save you. Tall monsters like Zlatan could use marking from John Terry too. The conclusion is simple. Chelsea is not the perfect side, but neither is anyone a perfect player. Play this team to your strengths, and you might even excel against other top sides more often than not. Thats all on this post everyone. I have some interesting posts which will be released soon. Until then, if you have any questions regarding my posts, or any questions you want me to answer regarding these posts, please feel free to leave a comment. As always, try and leave a like and subscribe. If you have any post requests feel free to leave a comment too. Thanks.